With 25 International Judges on the judges panel, these shows attracted over 1,800 dogs per day and exhibitors from 16 different countries. This show marks the beginning of the Show Calendar year for the Clube Portugues de Canicultura (CPC) and is quite popular as it is a meeting point for many exhibitors of the world. This year the show occupied 15,000 m2 and 3.5 halls and was held simultaneously with the Norte Pet Fair, thus providing attraction for many visitors. Due to these circumstances the CPC decided on an innovative plan which separated the grooming/exhibitor parking areas from the areas where the rings were mounted, thus allowing the public to circulate and admire the dogs being shown without interference from the exhibitors. The new layout was a success. There were 22 rings of large proportions as well as a separate large main ring and a VIP area reserved to judges. Several trade stands as well as the CPC stand and the Young CPC stand could be found in the main and larger Hall. All were very busy during the whole weekend. 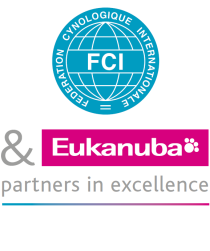 The international judges panel included judges from Ireland, The Netherlands, Belgium, UK, Russia, Spain, Poland, Italy and Portugal, many of them well-known international breed specialists. During the Saturday Show the Official Opening of the Iberian Champion Title was announced following a ceremony where the President of the Real Sociedad, Mr Julián Hernández and the President of the CPC, Carla Molinari, officially announced the beginning of this new cooperation between the two National Organisations. The Show was officially visited on Saturday by the Secretary of State of Food and Agriculture, Dr Nuno Vieira Brito, who presented the trophies for BIS and Best Portuguese Breeds in Show.